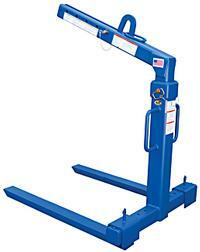 The Deluxe Overhead Load Lifter is designed for lifting and moving pallets, skids and crates with an overhead lifting crane. Includes an adjustable bail for keeping the load level when moving. 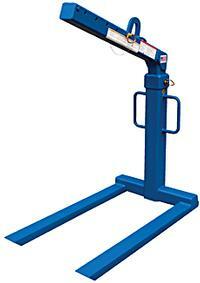 Includes three height positions for use with different sized loads. Series V-OLA (Pic. 1) features adjustable-width forks. Series V-OLF (Pic. 2) features fixed-width forks. Usable fork length is 42" on all units. Welded steel construction. Painted finish.